Dutch police arrested a Turkish-born suspect believed to be the gunman who killed at least three people and wounded several others on a tram in the city of Utrecht. The authorities were treating the attack as a possible act of terrorism. 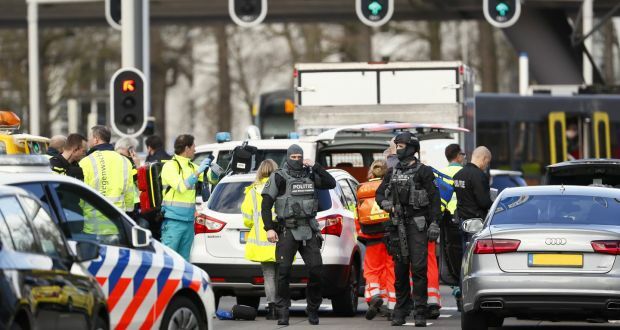 Dutch authorities have downgraded the terror threat level for the province of Utrecht to level 4 following the arrest of the tram shooting suspect, the National coordinator for security and Counterterrorism said on Twitter. Gokmen Tanis, 37, who has had previous run-ins with law enforcement, was arrested on Monday night, police said. Dutch authorities are considering “a possible terrorist motive” for the incident, which happened in 24 October Square at 10:45 a.m Monday. Utrecht Mayor Jan van Zanen said the motive behind the attack is “still unclear.”A second suspect has also been taken into custody, van Zanen said, adding that it’s not clear what his involvement was in the shooting.